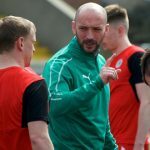 Ross Lavery insists that Dungannon Swifts’ recent results mean Cliftonville will take nothing for granted in tonight’s League Cup Quarter Final at Solitude. 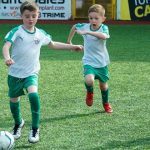 After a tricky start to the season, the County Tyrone side – who visit Solitude as the competition’s defending Champions – have enjoyed an upturn in recent weeks, leading Lavery to warn against taking their threat lightly. 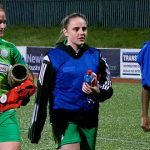 “You can’t underestimate any team, especially in a cup competition,” says the 22-year-old. You can read the full Lavery interview in tonight’s edition of our Matchday Magazine, which will be on sale at Solitude for £2.50. 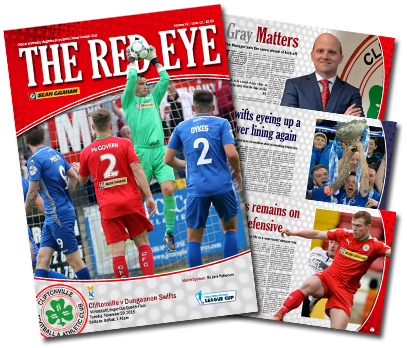 Alongside boss Barry Gray’s pre-match views, The Red Eye’s 13th issue of the campaign reflects on Dungannon’s campaign to date and steps 19, 81 and 132 years back down memory lane – plus plenty more besides. 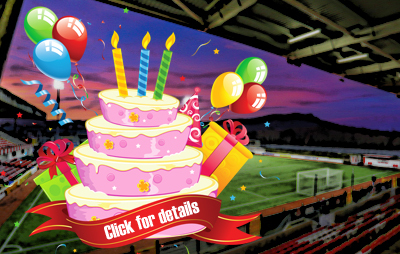 Members Tickets, Season Tickets and Family Tickets are NOT valid for this match.